Despite having an eshop, I want to provide all of my customers with the custom fit service. Therefore there is no simple XS/S/M/L/XL/XXL sizing (except for stock products), but I want you to provide your measurements so that I can ensure the best possible fit of made to measure fashion. This is the next best option to visiting me, when I take those measurements myself. 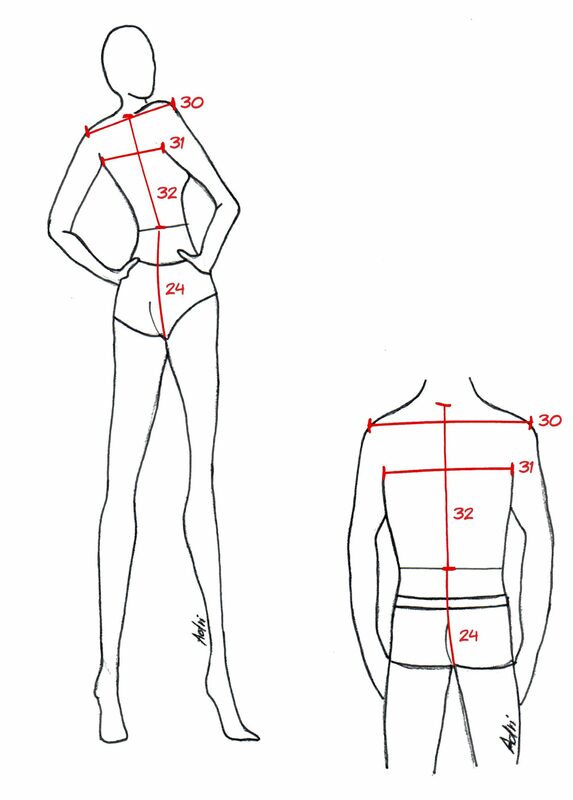 This tutorial provides you with basic information on how to take your own measurements. There is quite a few measurements I may need, but don’t be scared – for a particular dress I typically don’t need all of them and try to minimize measurements for you. Circumference taken around the head at the level of forehead. I need circumference of the lower part of your neck. 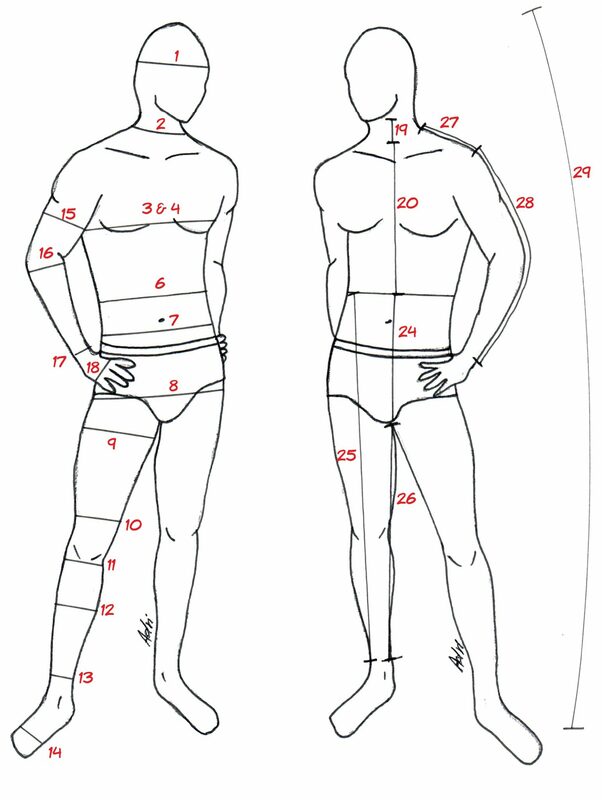 Measured across the widest part of your breast (women) or chest (men). 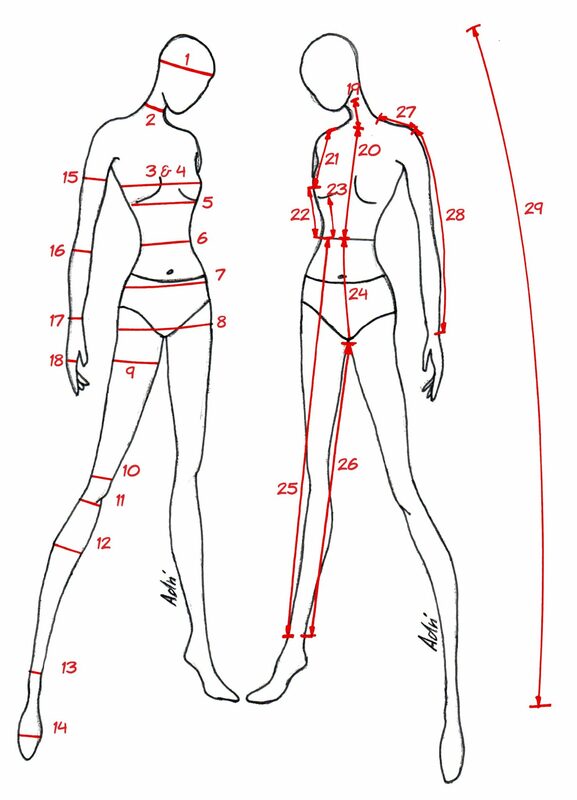 Measured from the mid of armpits across the widest part of your breast/chest. Circumference just below the breast. Measured in the narrowest circumference of your upper body. 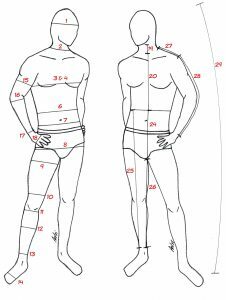 For the some measurements further below (namely measuring various lengths), tie a strap or string around your waistline so that you have reference point where to start measuring. Measured parallel to the waist about 10cm below it, across the bones. Measured horizontally in around widest point of your buttocks. Measured horizontally cca 5cm under the crotch. Measured at the widest spot of the foot. Measured at the widest spot of the hand above the thumb. Measured from the widest part of your neck to the chin. Measured from the widest part of the neck to the waist line. Measured from the waist line down to crotch and then on the back side to the waist line. Note that this measure is therefore visible both on the front and back side of the figure. Measured in the straight standing position. Measured from the ankle line to the crotch. From the neck line to the beginning of the shoulder joint. From the beginning of the shoulder joint to the wrist. From shoulder joint to the shoulder joint. From armpit to armpit, assuming hands freely hanging down. These size tables are used for stock items. A note on sizing of latex fashion: Use your real measurements and buy according to your normal sizing. The stretch effect (downsizing) is already counted in during design/manufacturing.